Those of you who know me know that I love to make things. I have lots of projects going at any given time, and I thought that by sharing them more often in this space it might push me to be more creative and more joyful in this small thing I love doing: making. This was a springtime project I tackled a few weeks ago. I bought some pretty fabrics to make napkins to use in food photoshoots, and I bought extra of this particularly beautiful cotton with yellow roses and purplish-gray leaves and another rust-colored greenery. 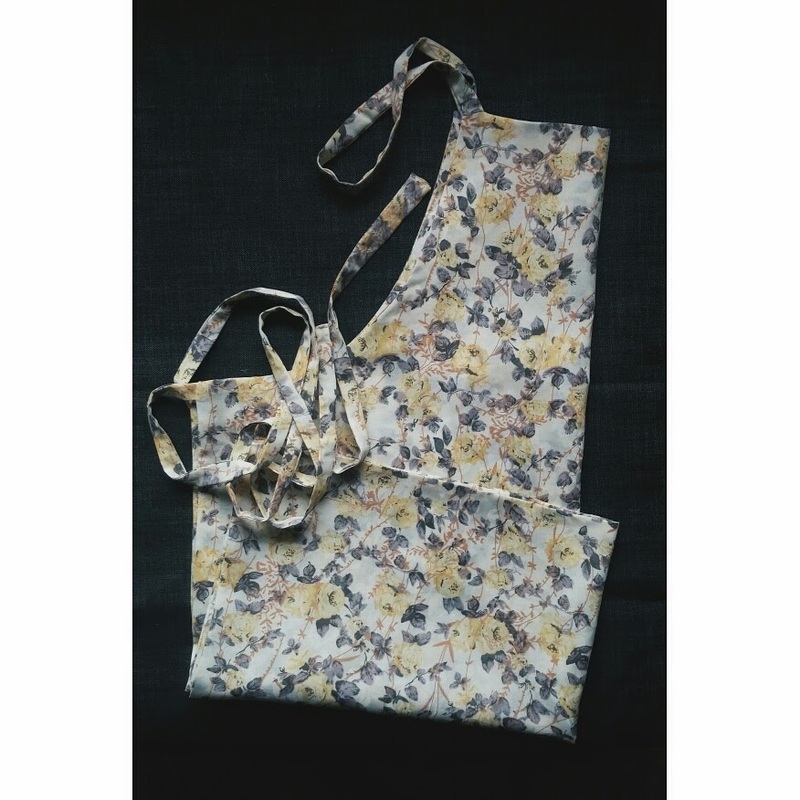 I immediately made a simple apron out of it. This isn't exactly a how-to, but I'll tell you how I did it. 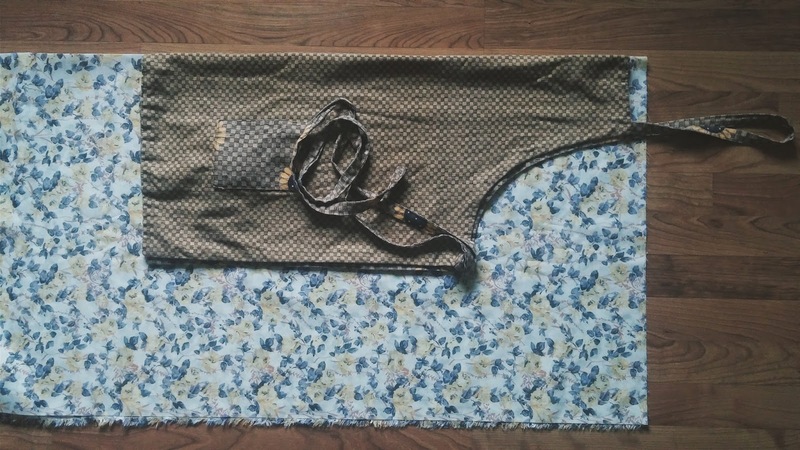 I have several wonderful aprons my mother made me about six years ago, and rather than use an apron pattern from the store, I just laid this down for my pattern, cutting and apron front and back (on the fold) with about 5/8 extra for a seam allowance, as my aprons are double-sided & reversible. Then I used the ties as guides to cut out ties, also leaving that 5/8 allowance. Then I sewed the ties together, leaving one end open, and turned them inside out. I did the same thing for the neck strap, leaving both ends open. Then I pinned the whole apron together with right sides facing in and with the straps pinned to the inside (where the right side of the fabric is). Then I sewed it all around, leaving about a six inch unsewn portion around the bottom so I could turn it right side out. Then I trimmed the corners, turned it right side out, used a corner turner to make the corners crisp, and ironed it. Last, I slip-stitched the opening closed. The whole project was fairly easy and only took me about 45 minutes. The rose apron cost me about $3 total in materials! You can't beat that. 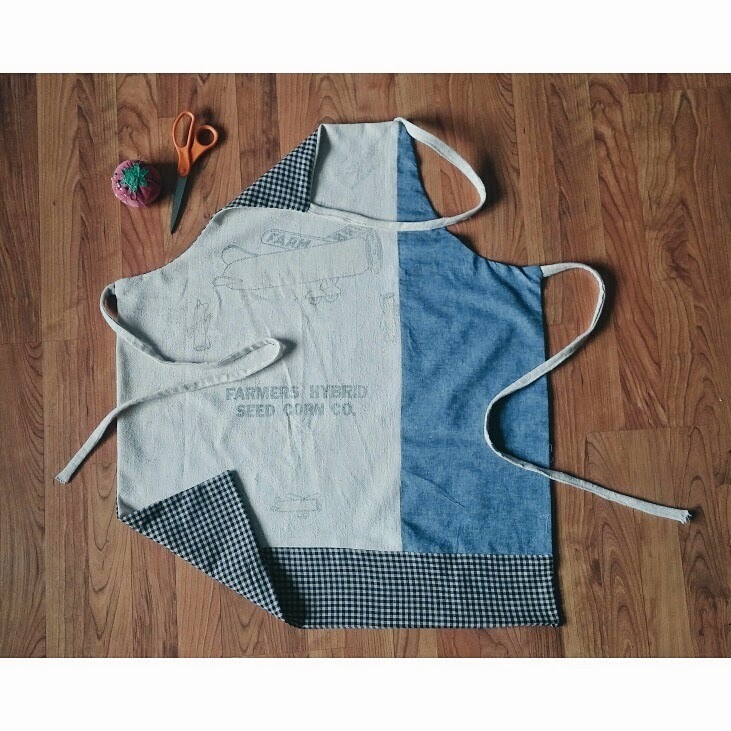 I was on a roll, so I made this other apron out of scraps I'd had lying around for awhile. I found a bunch of old flour & seed sack towels on the attic awhile back and decided to make some aprons. This fabric sat around as scraps for two years, but now it is a lovely seed-sack, gingham, and cotton apron. I love it. What are you making, lovely friends?